Cobblers chairman Kelvin Thomas has stressed he doesn’t want a new manager to ‘come in and rip it apart and change it’ at Sixfields as he searches for a replacement for Chris Wilder. 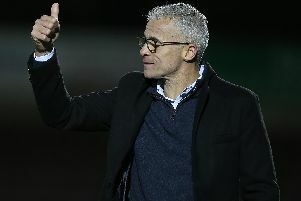 Thomas is currently talking to prospective managers to take over at Sixfields following Wilder’s decision on Thursday to quit and take over at Town’s Sky Bet League One rivals Sheffield United. The Town chairman had already spoken to four candidates before Wilder’s departure was confirmed, and was anticipating a rush of interest in taking over at the home of the league two champions. Several names have already been linked to the job thanks to the bookmakers, including the likes of Gary Bowyer, Steve Cotterill, Rob Page, Paul Tisdale and Andy Scott, and Thomas has now outlined the style of manager he wants to come in. The Cobblers are obviously a club on the up, and have a squad of players at the top of their game and oozing confidence, so not surprisingly, the Town chairman doesn’t want to rock the boat any more than is necessary after Wilder’s decision to move on and take assistant manager Alan Knill with him. “We have got a great group of players and I gave being talking to the captains, Marc Richards and Dave Buchanan, throughout the whole of this process, and will continue to do that. “We have a good structure, so we’re not looking for anybody to come in and rip it apart and change it. “That becomes very expensive, and as when we came into the club, we’re not believers in ripping things up that are working. “It is very important for us to find the right person who will come in and and fit in within the structure, but bring their own personality to it, bring their own ethic to it, and culture as it were, but within our framework.